As a historian of progressive management, I like to look at the past to see if it can tell us anything useful about the future. More often than not I find disturbing parallels which suggest that humans make the same mistakes when they are in similar circumstances. History may not exactly repeat itself, but it comes close enough that we should pay careful attention. In a recent blog post, Peak Lean, I suggested that interest in Lean management may now be peaking, broadly speaking, across all industries. That, in turn, suggests that as a result of applying Lean tools for 10 or 20 years, managers think they “know” Lean and have attained the largest share of gains that can be most easily be achieved. In other words, the wealth created by applying Lean tools has mostly been achieved. Additional wealth creation from practicing Lean management, versus just using some Lean tools, is likely seen by top executives as impractical or beyond easy or quick reach. The image at right shows the share of income for the top 1 percent in the United States from 1913 to 2011. The peak of Scientific Management was 1920 to about 1930. It was the age of new machines and new materials. The work of Scientific Management practitioners and efficiency experts (the latter being consultants who narrowly focused on implementing tools to improve operations) during that time and in the preceding years created great wealth for business owners, large shareholders, and top executives. Scientific Management lost relevancy by the late 1930s, and selected tools and methods were subsumed into general management practice. Top managers turned to other well-worn management practices to grow and generate wealth. Recent times have been the age of computer and software, the post-modern equivalent of new machines and new materials. Just as in the Scientific Management era, the work of Lean management practitioners and Lean consultants (who focused mainly on implementing tools to improve operations) have created great wealth for business owners, large shareholders, and top executives. And, Lean proved to be a great help for dealing with the Great Recession. But that’s “over.” Selected Lean tools and methods are now being subsumed into general management practice, and top managers are turning to other well-worn management practices to grow and generate wealth. 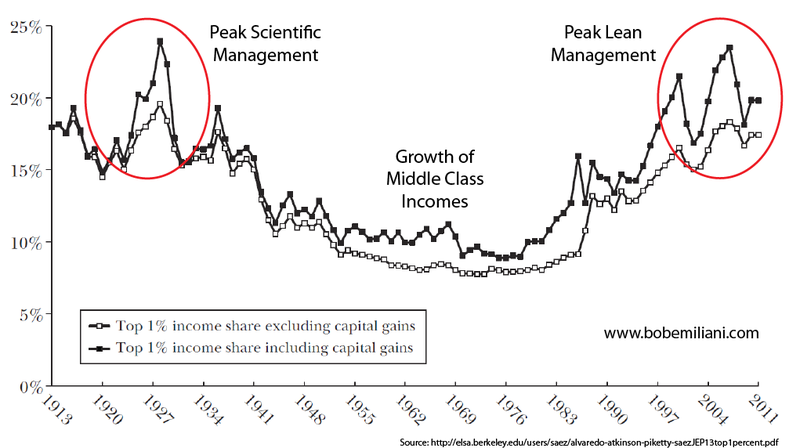 No doubt, there was a lot more going on than just progressive industrial management practices that contributed to the change in income share over time. Yet in both cases, top managers got incredibly stingy and decided not to share the gains in productivity with workers. There is plenty of money sloshing around to do exactly that. The average CEO pay is some 350 times that of the average worker in the United States, versus an average of about 20 in the rest of the industrial countries. In addition, large companies go into debt to acquire companies, buy back shares at high prices, and reward shareholders with ever-larger dividends (some of which favorably impacts impacts regular employees, though their stock holdings are normally so small in number that the gains are small). Think about it: $25 million gives a 5 percent raise to 10,000 employees making an average of $50,ooo per year. A company like Pfizer could give every one of its 78,000 employees a 10 percent raise, while shareholders would still receive 82 percent of the $6.58 billion in cash dividends they received in 2013. But no, 2 percent was a big raise in 2013, despite a net profit of $22 billion in 2013. Art Byrne, retired CEO of The Wiremold Company, has long said: “Productivity equals wealth.” What many people may not realize is that Art generously shared gains in productivity with Wiremold employees. They shared in the wealth created through increases in wages and through quarterly profit sharing. Art remains committed to that as a fundamental Lean practice. More than income inequality is the issue of fairness – income fairness – which is central to non-zero-sum (win-win) Lean management and is encoded into the “Respect for People” principle. Will the share of income of the top 1 percent fall and the share of income of the middle rise again? Nobody can predict the future, but it seems unlikely as computers and software displace people, creating a large surplus of labor which will drive down wages. In the future, capital will likely trounce labor, and new jobs may not get created as old ones are displaced. Most economists think otherwise, because this is what has always happened in the past. I think the economists are wrong and worry about the unsettling problems that may arise from high unemployment, declining net worth of working families, and increasing poverty. I am disappointed that, in general, the generation of executives who could have done the most good with Lean management did more harm that I ever expected they would. The baby boomers have learned little about Lean management and have essentially nothing to pass on to the next generation, who are left to discover the merits of Lean management for themselves – assuming they can overcome all the negatives resulting from “Lean done wrong” by their predecessors. Where do we go from here? Another blog post, Sustaining Lean, outlined the challenges we face. Many of us know well that Lean management has much more to offer than meets the eye, now and in the future, and that a herd mentality among executives that think Lean is passé is just plain wrong. But our conviction alone will not prevent Lean management from losing relevancy among today’s executives. We have to act. I do this every day by teaching Lean management – REAL Lean – to people who read my books, read my blogs, watch my videos, and take my courses. You too can help. You don’t have to be a teacher to teach others.